A matchless blend of exclusive shops, exquisite restaurants and expert services. Harbor Mall is located on the beautiful tropical island of Kauai. We're right across the street from the warm beaches of Kalapaki Bay. Look for the jungle green shopping center. 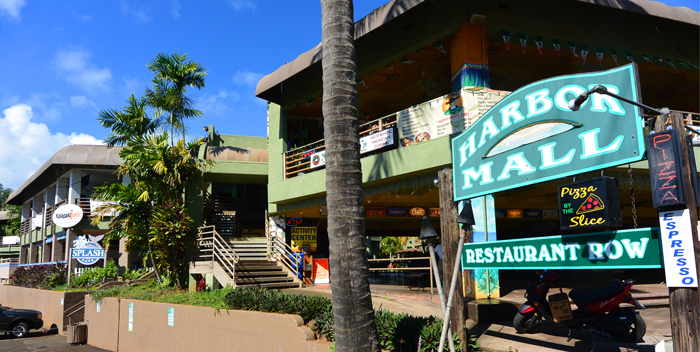 Harbor Mall's Restaurant Row boasts many fine restaurants and food establishments, offering outstanding dishes to please the most discriminating palates. You will love our charming array of specialty shops, boutiques, activities, souvenirs and personal services. You will discover that perfect vacation memento; a thoughtful gift for a loved one; an fabulous outfit with cool accessories; a breathtaking tour or activity; your favorite tattoo; and a timeless spa experience. Our businesses are locally owned, giving you a distinctive Kauai experience. It's a one of a kind opportunity you won't find anywhere else. We now have FREE WiFi. 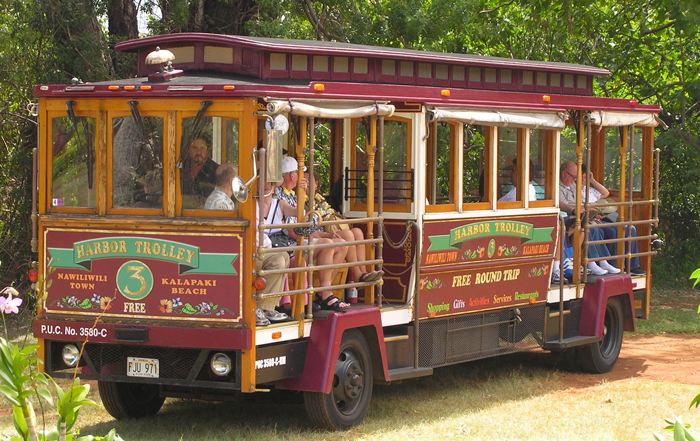 The password is available at Trolley Stop Tours & Gifts. Arriving by Cruise Ship? Our FREE trolley shuttle runs every day there is a cruise ship in the harbor. Free Updates! 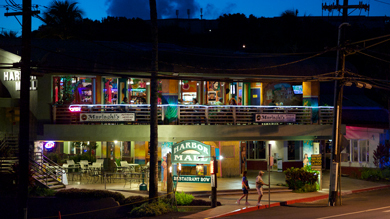 Like us on Facebook below- you'll see Sales, News, Events, and Happenings at Harbor Mall and around Kauai! Kauai Shopping! Aloha wear, boutique clothing, custom jewelry, gifts, books, souvenirs, local products, toys, hobbies, trains, collectibles, yarn shop, Free WiFi, vape shop, tattoo parlor, nail salon, firearms, outdoor gear, helicopter tours, discount activities, vintage trolley tours, zipline tours, 24 hour ATM, televised sporting events, mexican food, new york pizza, ice cream, shave ice, sandwiches, local food, used cars, car rental, overnight parking, and much more! Click here for a complete listing of our businesses. 3501 Rice Street #50, Lihue, Hawaii 96766. Copyright (c) HarborMall.net. All rights reserved.